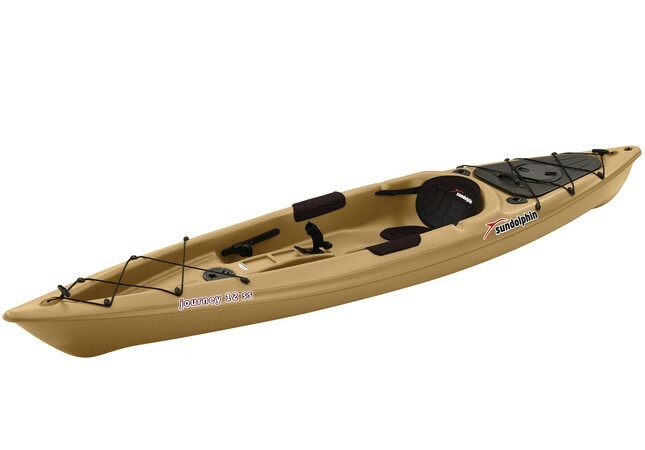 The Sun Dolphin Journey 12 SS is the a slightly bigger version of the original Journey 10 SS sit-inside fishing kayak. In addition to being slightly longer at 12’, the Journey 12 SS also loses half an inch in width with 29 1/2” compared to the 30” of the 10 SS. It is only 4 lbs heavier, at 48 lbs, but ups the capacity from 250 lbs all the way to a whopping 395 lbs. So, if you are looking at additional capacity and more legroom, then the Journey 12 SS is definitely worth the upgrade over the 10 SS. Apart from the weight and dimensions, the Sun Dolphin Journey 12 SS is virtually identical to the 10 SS, with the same pros and cons. Since it is slightly longer it does offer better tracking, but stability is still a bit of an issue. It is a decent kayak for beginners who want to do some fishing in lakes or ponds and could maybe even handle some calm rivers. For comfort the Journey 12 SS has adjustable foot braces, thigh pads and a padded seat that offers some decent back support. The seat is obviously not the most comfortable on the market, so some adjustments might be needed if you plan on spending hours fishing. This kayak has a decent amount of storage space at the front and back and the portable accessory carrier can be used for additional storage if you really need to bring along extra gear. The retractable carrying handles on this kayak are useful, but it is a good thing that it isn’t so heavy as there are no side carrying handles. Since the Journey 12 SS is a fishing kayak it has the obligatory two flush mount rod holders behind the seat along with a swivel fishing rod holder up front. A convenient paddle holder takes care of your paddle while you are operating the rods and making use of it only requires one hand, which is also nice. This kayak is by no means perfect and there are a lot of things about it that could have been improved, but it is still a good choice for first time buyers on a tight budget. It will get you out on the water and fishing until you are ready to put down some more cash for an upgrade.